The New and Exciting SGG-Extreme FL-3W solar powered flood light is an amazing ultra-high powered commercial grade solar powered light. This flood light has 30 High Efficient SMD-LED .5 watt LEDs. Perfect for use in illuminating large areas such as signs, horse riding arenas, parking lots, driveways, or any application where reliable, high-end illumination is required. • Perfect for Signs, Billboards, Statues, Monuments, Flags, Entrance Ways, and all Residential and Commercial uses. • Features 30 Super Bright White SMD/LEDs (High power 0.5 W per LED) with a Color Temperature of 5500K-6000K. • Upgraded 11.1 Volt 6 Ah Li-Ion Battery for long lasting operation. • Features 16.6 Volts, 11 Watt Polycrystalline Solar Panel (13 3/4" x 10 3/4"' x 1") for a quick and efficient recharge! • Waterproof Master Power Switch conveniently located on lamp body for easy access. • Includes Wall Mount and Solar Panel mounting brackets. • PIR motion sensor option will continue to operate the lamp as long as motion is detected in the security zone which is approximately 190 degrees and 75 feet deep. 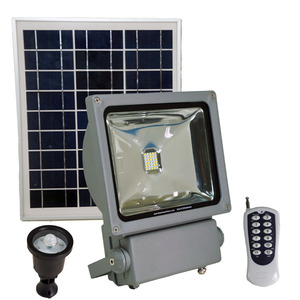 • Features included 3 Meter lead wire between lamp and solar panel along with a 3 Meter wire between PIR Motion Activated Security Sensor for perfect placement opportunities. • Operating control modes: Automatic on at Dusk or RF Remote Controller with independent Manual ON and OFF, Dimming and Timer functions paired with Motion Activated PIR Sensor. • The RF remote control also provides the ability to dim the lamp for your desired output, all the while extending battery operation. Additionally, the Timer Mode can be selected to have the flood lamp turn off automatically after dark in 2 hour increments from 2-10 hours. The RF remote can also be used to manually control the lamp with an ON/OFF function as well. • Operates for 10-12 hours on a full charge, with 10 hour max operation period at full power output. This new family of professional grade solar powered lamps, brings industrial quality to the solar lighting industry. Extreme care was taken in designing the placement of the battery. It is now easier than ever to change this component, all the while maintaining the watertight integrity of the LEDs. Dimensions: 13 3/4" x 10 3/4"' x 1"
what are the motion timing options for this light. Range of detection, time on, etc. The range of detection is approximately 190 degrees wide and 75 ft. deep You cannot control how long it illuminates, it stays illuminated as long as motion is detected within the security zone stated above. Thank you for your inquiry!